Astrobiology Is The Study Of Life In The Universe. Astrobiology concerns itself with life beyond our Earth. Astrobiology is the study of life in space. Astrobiology combines the aspects of astronomy, biology and geology. Astrobiology is focused primarily on the study of the origin, distribution and evolution of life. Astrobiology is also known as Exobiology or Xenobiology. 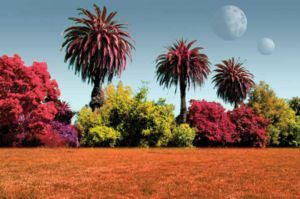 Pigments other than green might dominate plant life on exoplanets. The DNA structure might not be the only nucleic acid in the universe capable of supporting life. How did life arise on Earth?. What kind of environments can life tolerate?. How can we determine if life exists on other planets? How often can we expect to find complex life?. What will life consist of on other planets? Will it be DNA/Carbon based or based on something else?. What will it look like?. Although astrobiology is an emerging field, and still a developing subject, the question of whether life exists elsewhere in the universe is a verifiable hypothesis and thus a valid line of scientific inquiry. Astrobiology is a multidisciplinary field utilizing physics, biology, and geology as well as philosophy to speculate about the nature of life on other worlds. One commentator on the field, planetary scientist Dr. David Grinspoon, calls astrobiology a field of natural philosophy, grounding speculation on the unknown in known scientific theory (Grinspoon 2003). Since we have only one example of a planet with life (the Earth), most of the work is speculative and based on current understanding of physics, biochemistry, and biology. Though once considered outside the mainstream of scientific inquiry, astrobiology has become a formalized field of study. NASA now hosts an Astrobiology Institute. Additionally, a growing number of universities in the United States (e.g., University of Arizona, Penn State University, and University of Washington) Canada, Britain, and Ireland now offer graduate degree programs in astrobiology. A particular focus of current astrobiology research is the search for life on Mars. There is a growing body of evidence to suggest that Mars has previously had a considerable amount of water on its surface; water is considered to be an essential precursor to the development of life, although this has not been conclusively proven. At the present, the creation of theory to inform and support the exploratory search for life may be considered astrobiology's most concrete practical application. Missions specifically designed to search for life include the Viking program and Beagle 2 probes, both directed to Mars. The Viking results were inconclusive and Beagle 2 failed to transmit from the surface and is assumed to have crashed. A future mission with a strong astrobiology role would have been the Jupiter Icy Moons Orbiter, designed to study the frozen moons of Jupiter-some of which may have liquid water-had it not been canceled. In 2009, NASA plans to launch the Mars Science Laboratory Rover which will continue the search for past or present life on Mars using a suite of scientific instruments. 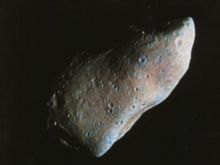 Asteroids containing microbial life from Earth have been ejected out into space; additionally, asteroid(s) may have transported life to Earth. As of 2007, there is no direct evidence of extraterrestrial life. Although examination of the ALH84001 meteorites, which were recovered in Antarctica and are thought to have originated from the planet Mars have provided what some scientists suggested to be microfossils of extraterrestrial life, the interpretation is disputed. In 2004, the spectral signature of methane was detected in the Martian atmosphere by both Earth-based telescopes as well as by the Mars Express probe. Methane is predicted to have a relatively short Half-Life in the Martian atmosphere, so the gas must be actively replenished. Since one possible source, active volcanism, has thus far not been detected on Mars, this has led scientists to speculate that the source could be (microbial) life - as terrestrial methanogens are known to produce methane as a metabolic byproduct. Missions to other planetary bodies, such as Mars Science Laboratory, ExoMars, Beagle 2: Evolution to Mars, the Cassini probe to Saturn's moon Titan), and the "Ice Clipper" mission to Jupiter's moon Europa hope to further explore the possibilities of life on other planets in our Solar System. Gliese 581 c, located 193 trillion km from Earth, is the first Earth-like extrasolar planet discovered within the habitable zone of its star (Credit: ESO). 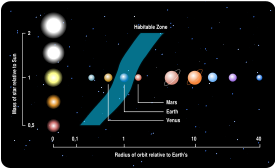 Efforts to answer secondary questions, such as the abundance of potentially habitable planets in habitable zones and chemical precursors, have had much success. Numerous extrasolar planets have been detected using the "wobble method" and transit method, showing that planets around other stars are more diverse than previously postulated. 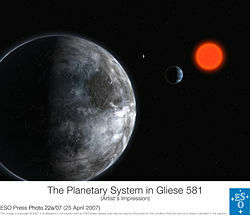 The first Earth-like extrasolar planet to be discovered within its star's habitable zone is Gliese 581 c, which was found using radial velocity. Due to technological limitations, most of the planets so far discovered have been hot gas giants, thought to be inhospitable to any life. It is possible that some of these planets may have moons with solid surfaces or oceans that are more hospitable. It is not yet known whether our solar system, with rocky, metal-rich inner planets ideal for life, is of an aberrant composition. Improved detection methods and increased observing time will undoubtedly discover more planetary systems, and possibly some more like ours. For example, NASA's Kepler Mission seeks to discover Earth-sized planets around other stars, by measuring minute changes in the star's light curve as the planet passes between the star and the spacecraft. Research into the environmental limits of life and the workings of extreme ecosystems is also ongoing, enabling researchers to predict what planetary environments might be most likely to harbor life. Progress in infrared astronomy and submillimeter astronomy has revealed the constituents of other star systems. Infrared searches have detected belts of dust and asteroids around distant stars, underpinning the formation of planets. Some infrared images purportedly contain direct images of planets, though this is disputed. Infrared and submillimeter spectroscopy has identified a growing number of chemicals around stars which underpin the origin or maintenance of life. In the book Rare Earth: Why Complex Life is Uncommon in the Universe, Peter Ward, a geologist and paleontologist, and Donald Brownlee, an astronomer and astrobiologist, came to the conclusion that life as we know it is rare in the universe. They stated that microbial life, however, was probably common in the universe, because of recently discovered extremophiles. The book stated that the chances of all the conditions that occurred to create the Earth occurring again would be rare; thus intelligent life would be rare. One important factor focused on in the book is Planetary habitability (see section below). How do we define life as we do know it? Life on Earth has DNA, a specific genetic code. It also uses only 20, and the same 20, amino acids. Life is always cellular according to some people, but I think not. I personally define a virus as alive. As for other life, what could it be? Could there be non-DNA life? If such life does exist, what does chemistry permit? Certainly chemistry permits certain types of life on our planet and others not. But once we move out in the solar system, especially in the vast realm of cold, chemistry changes. There could be different information systems, different solvents, different membranes. And as we go from hotter to colder, when we go to Venus, out to Mars, to Europa, and to Titan, we really should expect radically different chemistries. Astrobiology: Methodology, narrowing the task and Planetary habitability. When looking for life on other planets, some simplifying assumptions are useful to reduce the size of the task of astrobiologists. One is to assume that the vast majority of life-forms in our galaxy are based on carbon chemistries, as are all life-forms on Earth. While it is possible that non carbon-based life exists, carbon is well known for the unusually wide variety of molecules that can be formed around it. However, it should be noted that astrobiology concerns itself with an interpretation of existing scientific data; that is, given more detailed and reliable data from other parts of the universe (perhaps obtainable only by physical space exploration) the roots of astrobiology itself--biology, physics, chemistry--may have their theoretical bases challenged. Much speculation is entertained in the field to give context, but astrobiology concerns itself primarily with hypotheses that fit firmly into existing theories. The presence of liquid water is also a useful assumption, as it is a common molecule and provides an excellent environment for the formation of complicated carbon-based molecules that could eventually lead to the emergence of life. Some researchers posit environments of ammonia, or more likely water-ammonia mixtures. These environments are considered suitable for carbon or noncarbon life, while opening more temperature ranges (and thus worlds) for life. A third assumption is to focus on Sun-like stars. This comes from the idea of Planetary habitability. Very big stars have relatively short lifetimes, meaning that life would not likely have time to evolve on planets orbiting them. Very small stars provide so little heat and warmth that only planets in very close orbits around them would not be frozen solid, and in such close orbits these planets would be tidally "locked" to the star. Without a thick atmosphere, one side of the planet would be perpetually baked and the other perpetually frozen. In 2005, the question was brought back to the attention of the scientific community, as the long lifetimes of red dwarves could allow some biology on planets with thick atmospheres. This is significant, as red dwarves are extremely common. About 10% of the stars in our galaxy are Sun-like, and there are about a thousand such stars within 100 light-years of our Sun. These stars would be useful primary targets for interstellar listening. Since Earth is the only planet known to contain life, there is no way to know if any of the simplifying assumptions are correct. Divisions of astrobiology in astronomy. 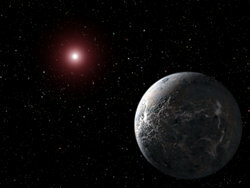 Artist's impression of the extrasolar planet OGLE-2005-BLG-390Lb (with surface temperature of -220ºC), orbiting its star 20,000 light years (117.5 quadrillion miles) from Earth; this planet was discovered with gravitational microlensing. The planned NASA Kepler Mission for the search of extrasolar planets. Most astronomy-related astrobiological research falls into the category of extrasolar planet (exoplanet) detection, the hypothesis being that if life arose on Earth then it could also arise on other planets with similar characteristics. To that end, a number of instruments designed to detect 'Earth-like' exoplanets are under development, most notably NASA's Terrestrial Planet Finder (TPF) and ESA's Darwin programs. Additionally, NASA plans to launch the Kepler Mission in 2008, and and the French Space Agency has already launched the COROT space mission. There have also been several less ambitious ground-based efforts are also underway (see Exoplanet). 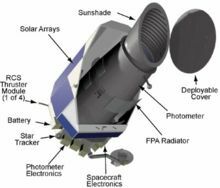 The goal of these missions is not only to detect Earth-sized planets but also to directly detect light from the planet so that it may be studied spectroscopically. By examining planetary spectra it will be possible to determine the basic composition of an extrasolar planet's atmosphere and/or surface; given this knowledge, it may be possible to assess the likelihood of life being found on that planet. A NASA research group, the Virtual Planet Laboratory (VPL), is using computer modelling to generate a wide variety of 'virtual' planets to see what they would look like if viewed by TPF or Darwin. It is hoped that once these missions come online, their spectra can be cross-checked with these 'virtual' planetary spectra for features that might indicate the presence of life. The photometry (astronomy) temporal variability of extrasolar planets may also provide clues to their surface and atmospheric properties. One mission was planned to the Jupiter moon, Europa, before recent cuts by NASA. This mission would have searched for life in the ocean of this moon. However, whilst the rationale behind the equation is sound, it is unlikely that the equation will be constrained to reasonable error limits any time soon. The first term, Number of Stars, is generally constrained within a few orders of magnitude. The second and third terms, Stars with Planets and Planets with Habitable Conditions, are being evaluated for the Sun's neighborhood. Another associated topic is the Fermi paradox, which suggests that if intelligent life is common in the universe then there should be obvious signs of it. This is the purpose of projects like SETI, which tries to detect signs of radio transmissions from intelligent extraterrestrial civilizations. Another active research area in astrobiology is Solar System formation. It has been suggested that the peculiarities of our solar system (for example, the presence of Jupiter as a protective 'shield' or the planetary collision which created the Moon) may have greatly increased the probability of intelligent life arising on our planet. No firm conclusions have been reached so far. Hydrothermal vents are able to support extremophilic bacteria on Earth, and may also support life in other parts of the universe. extremophiles (organisms able to survive in extreme environments) are a core research element for astrobiologists. 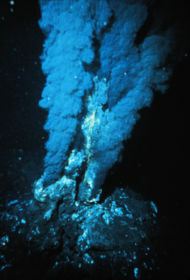 Such organisms include biota able to survive kilometers below the ocean's surface near Hydrothermal vents and microbes that thrive in highly acidic environments. Characterization of these organisms-their environments and their evolutionary pathways-is considered a crucial component to understanding how life might evolve elsewhere in the universe. Recently, a number of astrobiologists have teamed up with marine biologists and geologists to search for extremophiles and other organisms living around hydrothermal vents on the floors of our own oceans. Scientists hope to use their findings to help them create hypotheses on whether life could potentially exist on certain moons in our own solar system, such as Europa. The origin of life, as distinct from the evolution of life, is another ongoing field of research. Oparin and Haldane postulated that the conditions on the early Earth were conducive to the formation of organic compounds from inorganic precursors and thus to the formation of many of the chemicals common to all forms of life we see today. The study of this process, known as prebiotic chemistry, has made some progress but it is still unclear whether or not life could have formed in such a manner on Earth. The alternative theory of panspermia is that the first elements of life may have formed on another planet with even more favourable conditions (or even in interstellar space, asteroids, etc. ), and then have been carried over to Earth by a variety of means. The fossil record provides the oldest known evidence for life on Earth. By examining this evidence, geologists are able to better understand the types of organisms that arose on the early Earth. Some regions on Earth, such as the Pilbara in Western Australia are also considered to be geological analogs to regions of Mars and as such might be able to provide clues to possible Martian life. Astrobiology and other life in the solar system: Life on Europa. The two most likely candidates for life in the solar system (besides Earth) are the planet Mars and the Jovian moon Europa. This speculation is primarily based on the fact that these two planetary bodies may have liquid water, a molecule essential for life as we know it for its use as a solvent in cells. Water on Mars is found in its polar ice caps, and new canals recently observed on Mars suggest that liquid water may exist on the planet's surface. As for Europa, liquid water likely exists beneath the moon's icy outer crust. This water may be warmed to a liquid state by volcanic vents on the ocean floor (an especially intriguing theory considering the various types of extremophiles that live near Earth's volcanic vents), but the primary source of heat is probably tidal heating. Astrobiology is the reason we go into space, to answer fundamental questions about the origins of life and how it evolved, and whether there are other places where organisms are living. It is the whole justification for future space missions. Astrobiology has had to struggle for respectability; while many scientists are enthusiastic about the broad questions involved, there remains concern as to whether astrobiology is distinct enough from its parent disciplines (particularly biology) to constitute a true science. At present Astrobiology includes a highly speculative extrapolation of terrestrial conditions into extra-terrestrial environments. Extremophiles, for example, may reveal how life has evolved in exotic locales throughout the universe, yet this remains unverified and the study of extremophiles is adequately covered under the rubric of biology. This ambivalent status is reflected by academic acceptance: those interested may specialize in astrobiology as a subset of an established science. Although some have thought a formal degree program in astrobiology unlikely, the University of Glamorgan, UK, started just such a degree in 2006. For the last 3,000 years of our science, we really haven't gotten around to the notion that there might be something going on somewhere other than in this small, rural village [called Earth], in this isolated corner of our own galaxy or the Universe itself. There are some who now consider xenobiology separate from astrobiology for this reason. They stipulate that astrobiology is the search for earth-like life outside of our solar system. Xenobiologists, they say, are concerned with the possibilities open to us once we consider that life need not be carbon-based or oxygen-breathing, so long as it has the defining characteristics of life. As with all space exploration, there is the classic argument that there is still a lot more scientists have to learn about Earth. Even though the discovery of life in an extra-terrestrial environment would be exciting to many scientists, it is speculated there are millions of undiscovered or unclassified species on Earth, especially in environments with rich biodiversity such as the tropics. The deepest oceanic depressions are also believed to contain unknown species, possibly also of great potential interest for the theories on evolution. Critics of astrobiology may prefer that federal funding remain dedicated towards searching for unknown species in our own terrestrial biosphere. They feel that earth is the most plausible and practical region to search for and study life. The International Journal of Astrobiology, published by Cambridge University Press is the forum for practitioners in this interdisciplinary field. Astrobiology, published by Mary Ann Liebert, Inc., is an authoritative peer-reviewed international journal created as a forum for scientists seeking to advance our understanding of life's origin, evolution, and distribution in the universe. Astrobiology brings together researchers through the dissemination of original research, hypothesis, education articles, and reviews. Jakosky, Bruce M. Science, Society, and the Search for Life in the Universe. 2006. The University of Arizona Press. Grinspoon, David. "Lonely Planets". 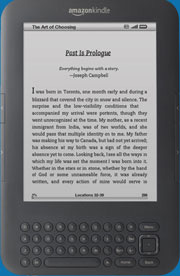 (HarperCollins 2003). Dec 27, 2005 - A planet forming disk located about 375 light-years from Earth has been found to contain some of the building blocks of life: acetylene and hydrogen cyanide. The chemicals were discovered around "IRS 46" using NASA's infrared Spitzer Space Telescope. When mixed with water in a laboratory, these chemicals create a soup of organic compounds, including amino acids and a DNA base called adenine. Dec 9, 2005 - The NASA Institute for Advanced Concepts has recently awarded a Phase II grant for a unique robot design that could hop across the surface of Mars. An array of these tiny robots could be deployed on Mars, coordinating with one another like a swarm of insects. Dr. Penelope Boston speaks to Astrobiology Magazine about the research and future potential for this direction of robotic exploration. Nov 17, 2005 - More than half the stars in our galaxy are small, dim M-class stars. Until now, researchers looking for extraterrestrial civilizations have passed over them, since they probably don't give off enough light to support life. But SETI researchers now think that they might be good candidates after all. A planet in orbit around an M-class star would have billions and billions of years orbiting its slow-burning star for life to evolve. Nov 9, 2005 - Scientists have found that hardy bacteria can survive a trip into space, and now the list of natural astronauts includes lichen. During a recent experiment by ESA, lichen astronauts were placed on board the Foton-M2 rocket and launched into space where they were exposed to vacuum, extreme temperatures and ultraviolet radiation for 14.6 days. Upon analysis, it appears that the lichens handled their spaceflight just fine, in fact, they're so hardy, it's possible they could survive on the surface of Mars. Nov 2, 2005 - Researchers have discovered methane-producing microbes in some of the most inhospitable deserts here in Earth, bolstering the theory that methane detected in the Martian atmosphere was caused by life. The scientists collected soil samples near the Mars Desert Research Station in the Utah desert. They added a growth medium to the soil, and detected methane gas being released. This isn't conclusive evidence of life on Mars, but it helps make the case that microbial life can and might exist on the Martian surface. Oct 19, 2005 - We live in a big galaxy with billions of stars. So, where is everybody? In his classic equation, Frank Drake developed a formula that could calculate the number of intelligent alien species in our galaxy - there should be many civilizations out there. But the Fermi Paradox says, if there are so many alien species, why haven't we met them? Steven Soter has written an article for Astrobiology Magazine that runs tries to get to the bottom of this contradiction. Oct 12, 2005 - NASA researchers have found that many of the basic building blocks for life here on Earth are common throughout the Universe. Using the Spitzer Space Telescope, the researchers observed that complex organic molecules called polycyclic aromatic hydrocarbons (PAHs) are everywhere they looked: in the Milky Way and in the most distant observable galaxies. Most of these molecules contain nitrogen, which is the key requirement for life. Oct 5, 2005 - Members of the Arctic Mars Analog Svalbard Expedition (AMASE) are working on devices that could detect life on the surface of Mars. But first, they're testing their equipment and methods here on Earth. The team analyzed samples of ice inside blue ice vents in a frozen volcano in Norway, and detected living and fossilized microbiota. Ecosystems of bacteria like this could live huddled around areas of relative warmth on the surface of Mars, and future rovers could detect them. Sep 5, 2005 - There's a long chain of events that led from the collapse of our local cloud of gas and dust to the evolution of life here on Earth. Exactly how each of these steps unfolded is still a bit of a mystery, but scientists know that a few atomic combinations were necessary: water, and organic compounds containing carbon. Dying stars are the source for this carbon, which they belch out, creating a kind of carbon soot. From there, this soot is blasted by intense radiation to create more than 100 different molecules, including fatty acids and simple sugars. Aug 22, 2005 - This is part 2 of an edited transcript of a presentation given by Pamela Conrad, a NASA astrobiologist who has been travelling to the ends of the Earth to study the extremes of life. In this second part, Conrad continues her explanation of how studying cold deserts here on Earth can aid the search for life in our Solar System. Part 1 is available here. Aug 18, 2005 - Pamela Conrad is an astrobiologist with NASA's Jet Propulsion Laboratory. She recently gave a lecture explaining how to searching cold deserts on Earth will help scientists understand environments that life could be hiding in the rest of the Solar System. The following article is the first part of an edited transcript of her presentation. Aug 11, 2005 - Researchers from Carnegie Mellon University and NASA are preparing to head back to Chile's Atacama desert to search for evidence of life with Zoë, an autonomous solar-powered rover. During this third trial, Zoë will travel 180 km (112 miles) across the desert, seeking micro-organisms. Researchers have chosen Atacama because it's one of the driest places on Earth, and one of the best analogs for finding life on Mars. This time around, it'll build a 3D map of soil to show how populations of bacteria cluster together. Jul 29, 2005 - Using the Spitzer Space Telescope, astronomers have discovered organic molecules in galaxies more than 10 billion years light-years away. This means these organic molecules - considered the building blocks of life - were present when the Universe was only a few billion years old. Spitzer found the molecules in starburst galaxies which are going through intense star formation. This means that life has had a long opportunity to gain a foothold in the Universe. Jul 28, 2005 - NASA engineers are working on a new instrument that could peer through rock and dirt on Mars to see evidence of life under the surface. The Neutron/Gamma ray Geologic Tomography (NUGGET) would be wielded by a Martian rover, and aimed at suspicious rocks. By releasing a focused beam of neutrons, some of atoms in the target rock will capture them and give off a characteristic gamma ray signature, measurable by the instrument. Ancient fossils embedded in the rock would be revealed by their chemicals. Jul 19, 2005 - Scientists can tell us what our climate on Earth was like in past by examining ice cores taken from glaciers. Tiny bubbles of air are trapped in the ice and maintain a historical record of ancient atmospheres. The effects of life make their mark in these ice samples as well. 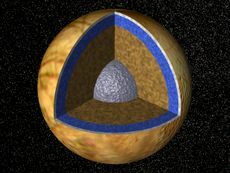 What if you examined the icecaps on Mars, or the layers of ice on Europa? NASA is considering a proposal for a small spacecraft that would land on Mars or Europa and melt its way throught the ice, collecting data as it descended, searching for clues about the presence of life. Jul 19, 2005 - When humans first step onto the surface of Mars in the coming decades, they'll be like kids in a candy store; so many rocks to turn over or chip away at. Is that discoloured patch algae? A team of Spanish engineers are working on a Cyborg Astrobiologist that could help observe the landscape with a video camera, see what the astronauts see, and suggest places that might be interesting for further study. Larry Klaes reports on this interesting new technology, but he thinks robots could use a system like this even sooner. Jun 20, 2005 - Does life exist elsewhere in the Universe? This question continues to puzzle scientists, but now Professor David Catling at Bristol University thinks that significant oxygen in the atmosphere and oceans of a distant planet are required for complex organisms to evolve. The fact that it took almost 4 billion years here on Earth means that other planets might not have a lot of time to evolve complex life. Since our Sun still has another 4 billion years before it dies, life has time to flourish, but planets around other, more short-lived stars might not be so lucky. May 11, 2005 - A researcher from Washington University in St. Louis is developing techniques that will help understand how early life developed and diverged here on Earth, to help predict where and what form it might take on Mars. Carrine Blank has traced the genetic relationships between different classes of bacteria, and determined when they broke away from each other to evolve into distinct organisms. These patterns of divergence have happened in several places on Earth, so it's possible they happened on Mars too. May 4, 2005 - The theory of panspermia proposes that life really gets around, jumping fron planet to planet - or even from star to star. Life might be everywhere! Assuming this is true, how do single-celled bacteria make the journey through the vacuum of space? Easy, they use chunks of rock as space ships, in a process called lithopanspermia. And now, researchers from Princeton and the University of Michigan think that life carrying rocks might have been right there at the beginning of our solar system, keeping their tiny astronauts safe and sound, frozen in statis until the planets formed and the right conditions let them thaw out, stretch their proteins, and begin a process leading from microbe to mankind.